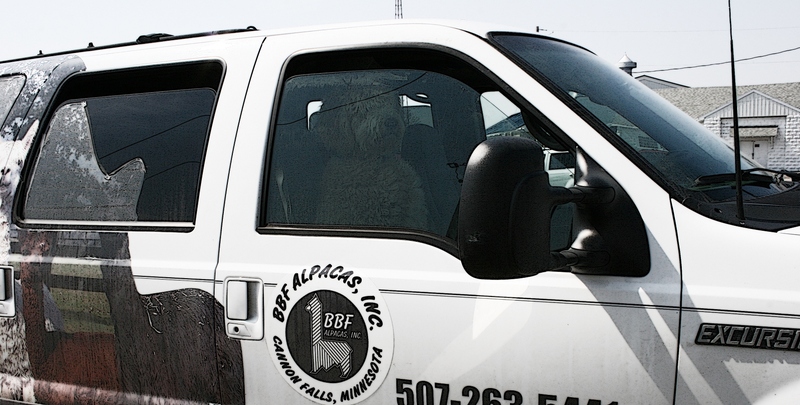 One of the dogs spotted in a truck at the alpaca expo. Photo edited to make the dog more visible through the side passenger window. EXITING OUR VAN at the Four Seasons Centre in Owatonna recently to attend the Minnesota Alpaca Expo, my husband and I did a double take. 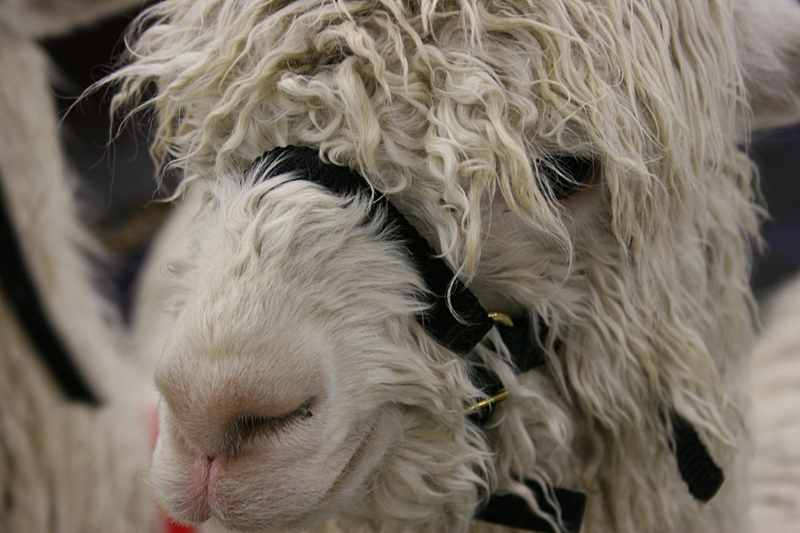 An alpaca appeared to be seated in a Ford Excursion hitched to a livestock trailer. But, no, that couldn’t possibly be. And it wasn’t. Upon closer inspection, we discovered two shaggy dogs (sorry, I don’t know breeds) inside the SUV. From a distance, though, they look remarkably similar to alpacas. 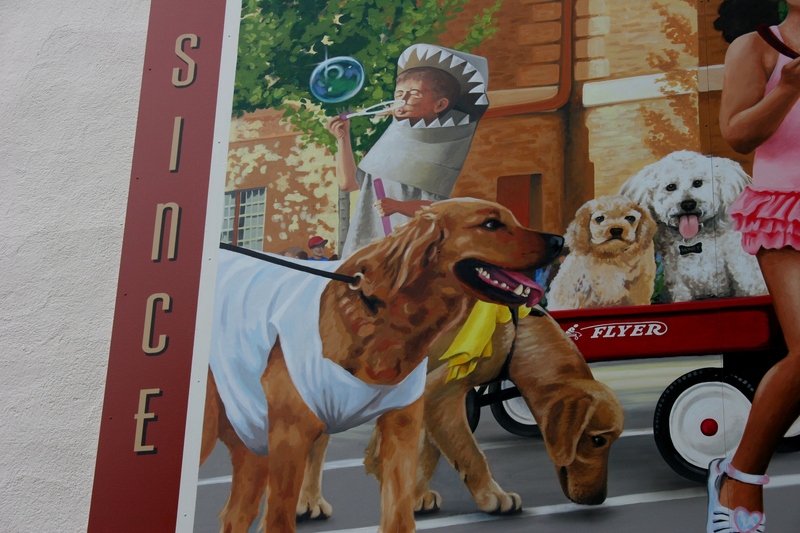 Now lest you are concerned that these canines were in danger and we should have phoned animal control, not to worry. Windows were open and temps were in the low sixties. HOW MANY TIMES HAS MY FAMILY driven Minnesota Highway 60 east of Elysian, unaware of Okaman Elk Farm to the south not far from the highway? Too many. My husband Randy and I almost missed Okaman’s again last Sunday as we traveled along Waseca County Roads 3 and 5. 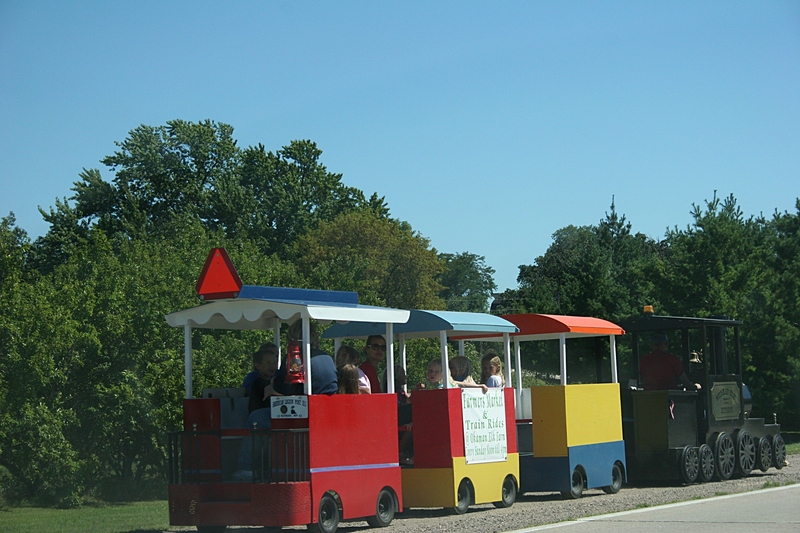 If not for the colorful miniature train transporting kids and adults along the shoulder of the road, we likely would have passed right by. Passing by the Okaman Elk Express in our car on a Sunday afternoon. But that train stopped us in our tracks and caused us to turn around and drive back to the farm. There we discovered much more than a plain old elk farm. 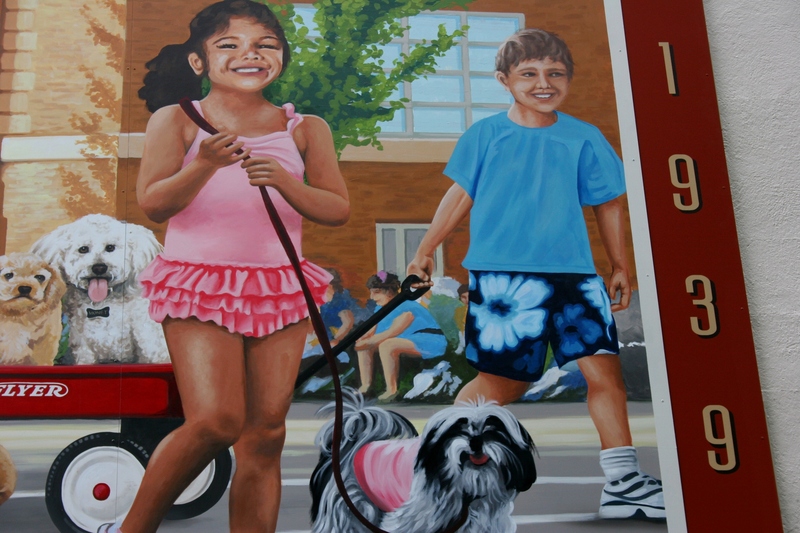 We also found family-friendly activities, a farmers’ market, art, animals and history. 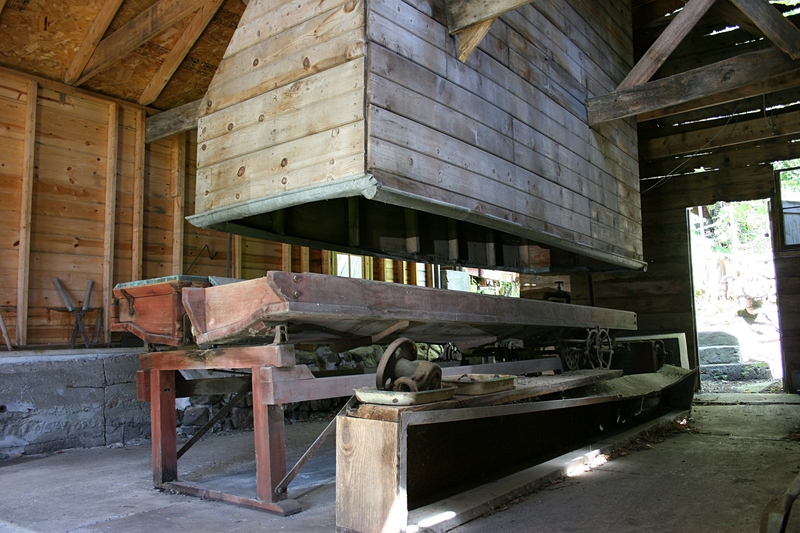 The historic Seha Sorghum Mill. In 1991, Don and Joyce Kaplan bought this historic place to raise elk and then sell the meat. Their business sits on the site of Okaman, a town established in 1855 between Lake Elysian and Lily Lake. Here, according to a posted sign, several hotels, a theater, the Buckout Flour Mill, the Okaman School and the Seha Sorghum Mill were located. It is that 1895 sorghum mill, which produced and sold sorghum syrup until 1953, that most interested me. Randy and I poked our way through and around the old mill trying to determine how the whole operation worked. I think he understood the process much better than me. Apparently wagons of sorghum were unloaded atop the hill behind the mill where the canes were crushed and the juice then flowed into steam-heated cookers, or something like that. 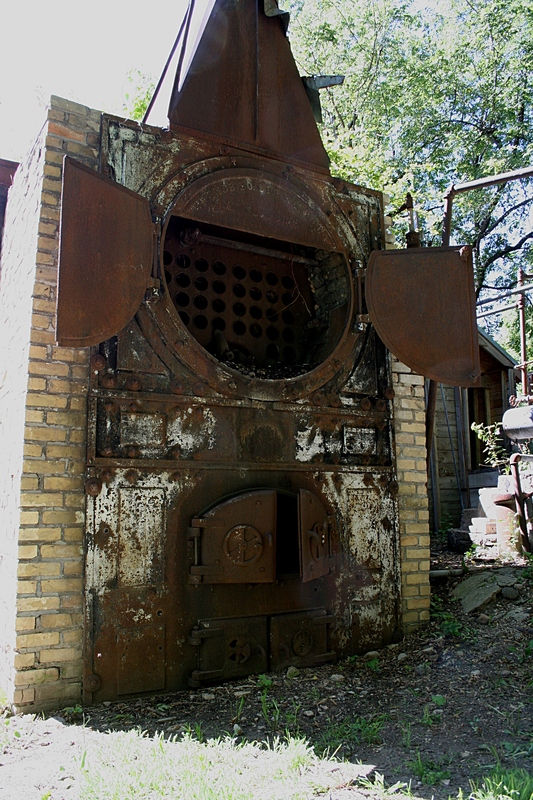 The original steam boiler stands behind the sorghum mill. 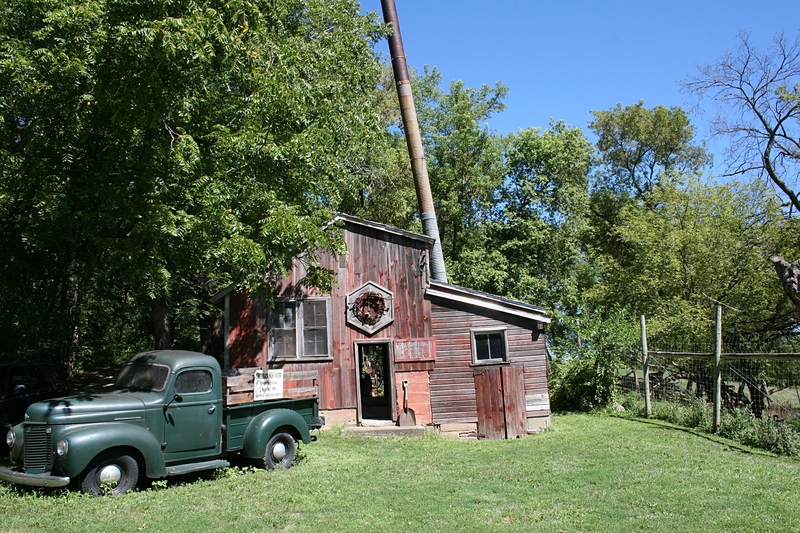 According to the Waseca County Historical Society website, Cornelius L. Seha built the mill, today the only known historical sorghum mill remaining in Minnesota and added to the National Register of Historic Places in 1979. Because the mill today is basically an old building and steam boiler with weeds and brush growing around the holding tanks, equipment and structures, everything is left open to self-interpretation. Perhaps someday this historic site can be restored and specific educational information posted. Then, perhaps, the younger farm visitors will be more interested in the historic buildings. 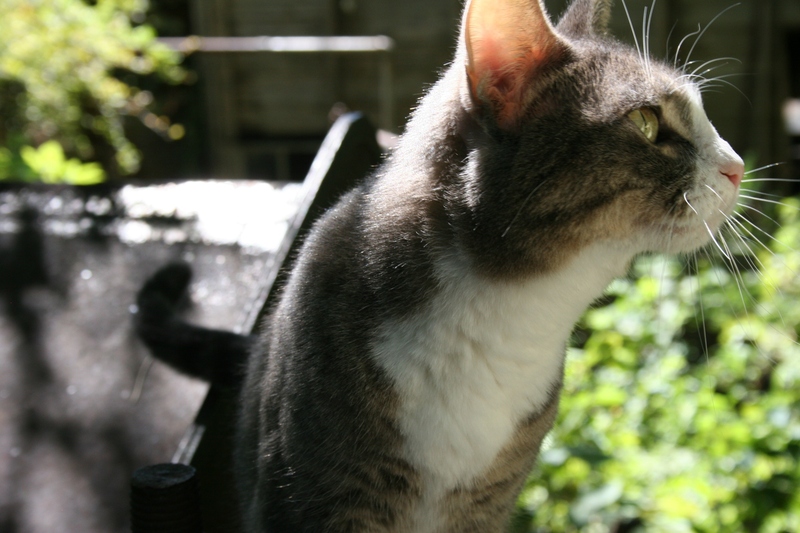 They are, for now, focused on the donkeys and alpacas, the goats and elk and dog, and especially, the cats and kittens. Or perhaps the playground equipment. 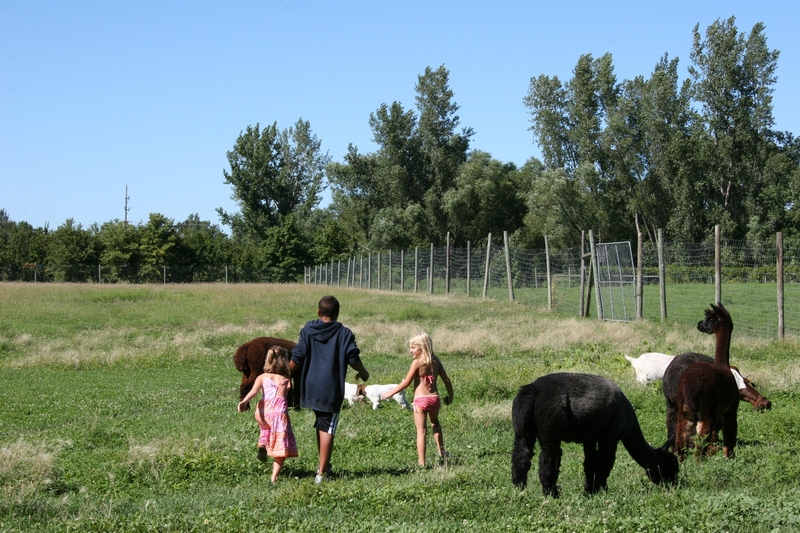 Visitors are free to wander the pasture with the alpacas, donkeys and goats. 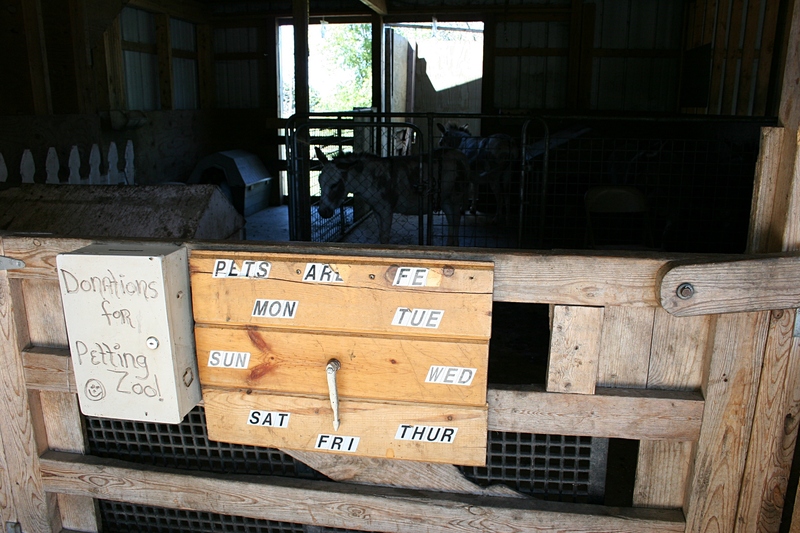 Loved this sign at the petting zoo telling visitors that the animals are fed daily. 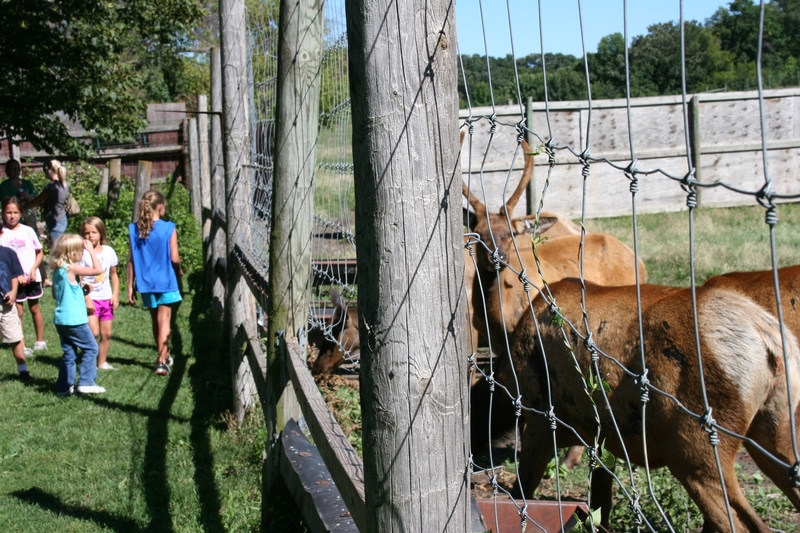 You can enter the petting zoo pens or pastures at your own risk. Please don’t allow children to chase the animals and no dogs allowed. Close gates behind you. Veggies from R & C Produce of Otisco. 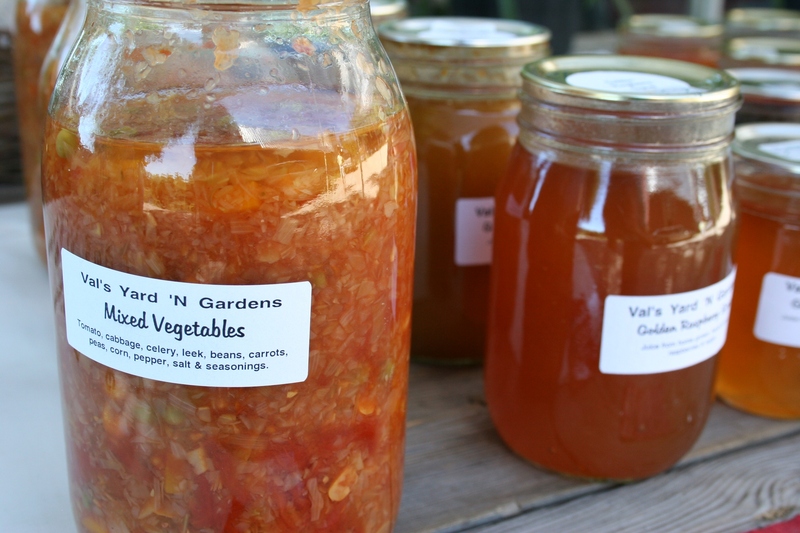 Canned mixed veggies from Val’s Yard ‘N Gardens (Joe & Val Zimprich of Le Center). 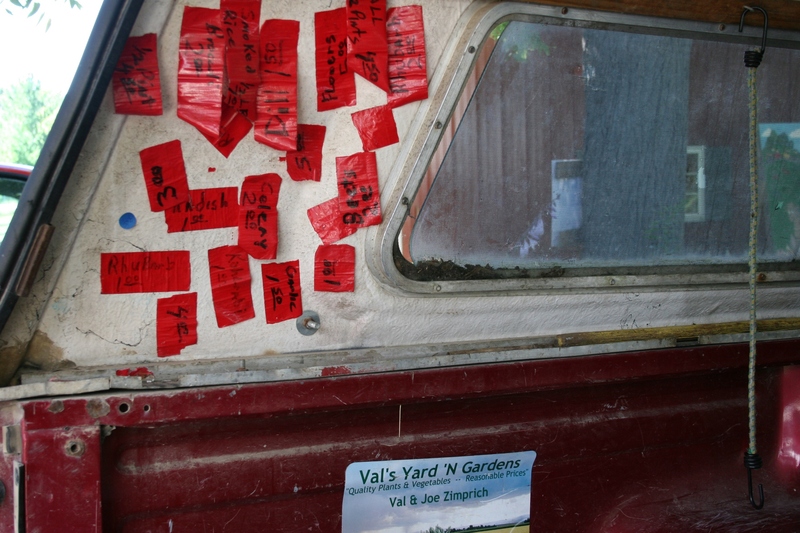 Reusable price stickers in the back of the Zimprichs’ truck. 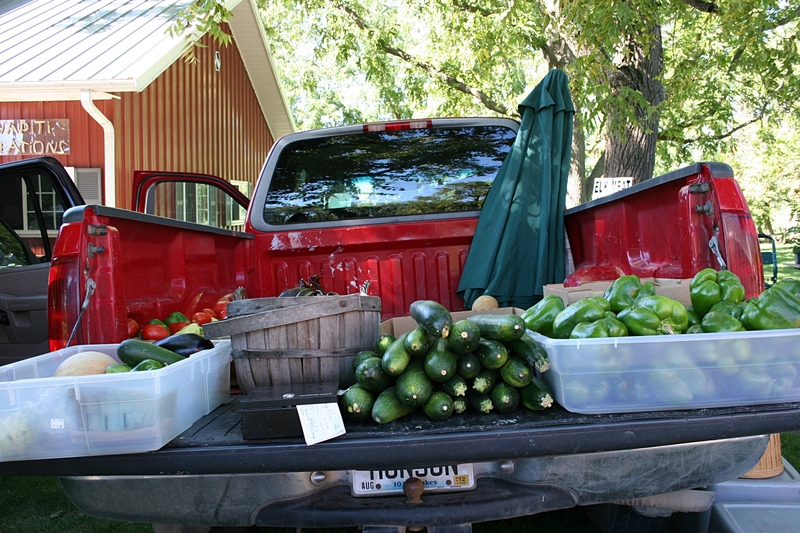 While the farm is always open, on Sundays from 1 p.m. – 4 p.m. during the summertime harvest and into October, farmers’ market vendors set up in the farmyard peddling their garden fresh produce and other products. 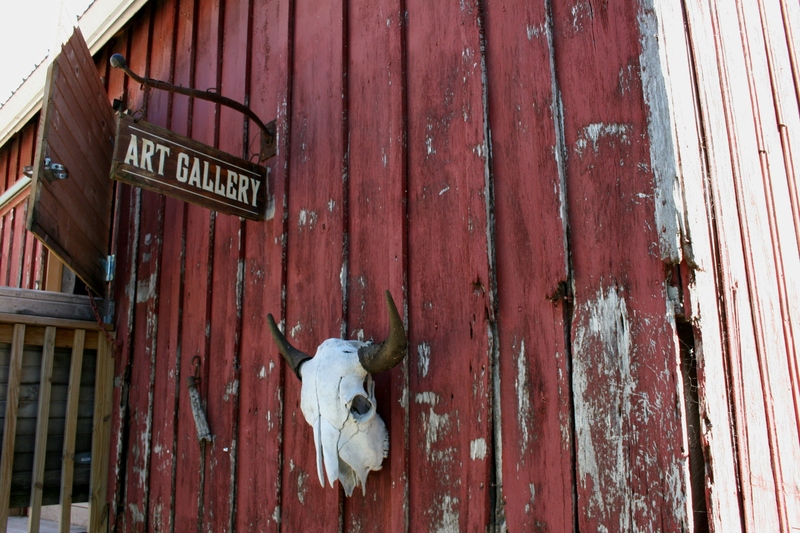 An art gallery is housed in an old barn. That beautiful old barn, with an art gallery and studio in the haymow. 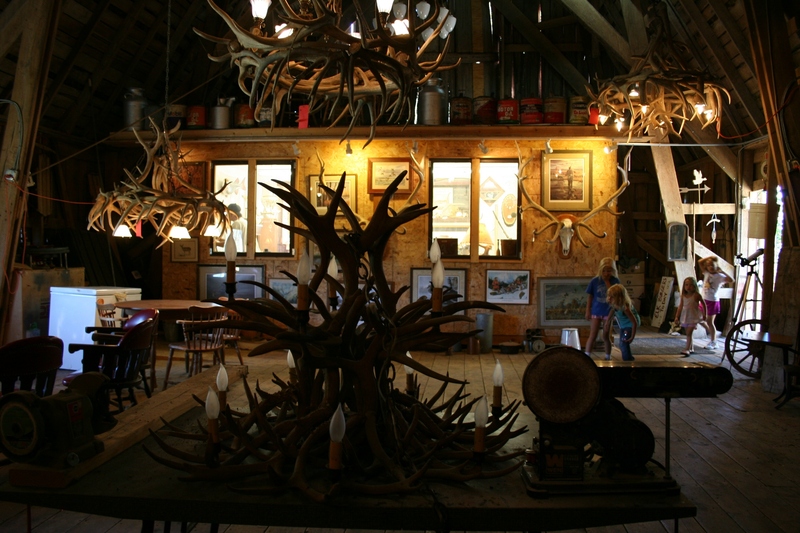 Antler art, including chandeliers, inside the art gallery with Paul Ristau’s art studio behind the windows pictured here. Inside the gift shop and adjacent art gallery, you’ll find gifts anytime and the creations of artist and craftsman Paul Ristau, who renovates homes and businesses and is a mason specializing in stone fireplaces. He was doing some tile work for the Kaplans and ended up as their in-house artist focusing on the creation of antler art. He has a workshop in the haymow-turned-art-gallery where his elk antler chandeliers are a focal point. 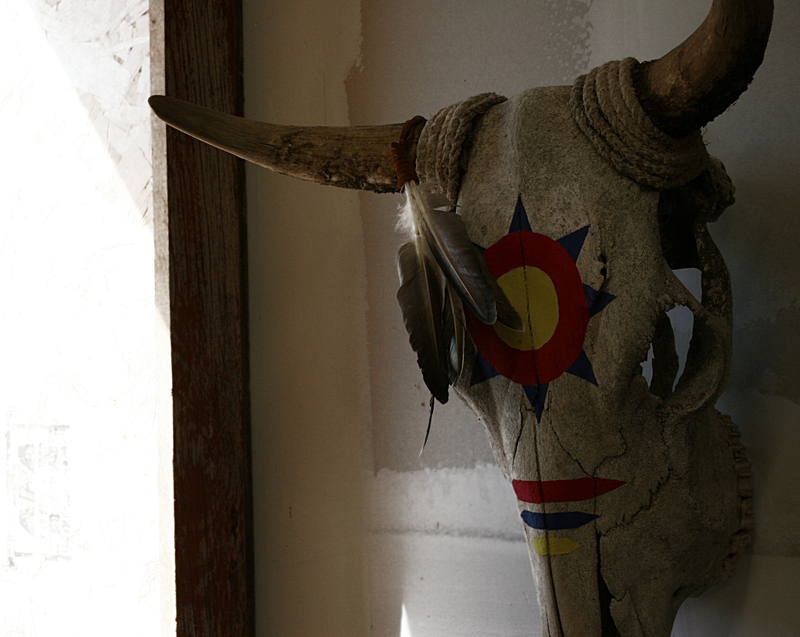 A Native American influence on art hung in Paul Ristau’s studio. A Native American influence is visible in Ristau’s art given his interaction with those living on the White Earth Indian Reservation where he once drove bus. Of course, the farm also sells elk meat, inside the original 1893 homestead. The farm is now down to 23 elk, according to Joyce Kaplan who says she grew up on a farm and has been cleaning barns all her life and maybe it’s time soon to stop cleaning barns. The final activity of the day, feeding apples to the elk. On the Sunday I visited, her husband was handing out apples so the kids could feed the elk. And the Okaman Elk Express was chugging along the shoulder of the roadway, thrilling the kids and, bonus, drawing in visitors like my husband and me. 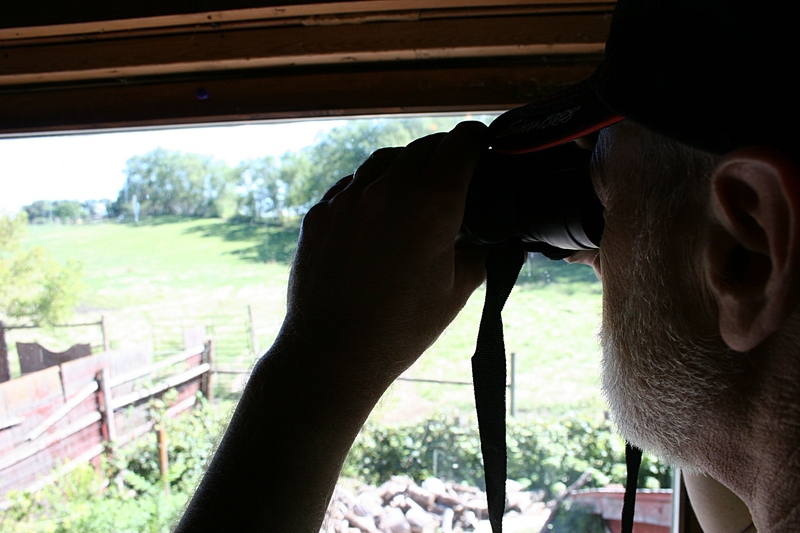 You’ll find binoculars in the barn to view the elk in the pasture. FYI: To find Okaman Elk Farm, take Minnesota Highway 60 east of Elysian 1 ½ miles and then turn south to the intersections of Waseca County roads 3 and 5. The farm is open year-round. 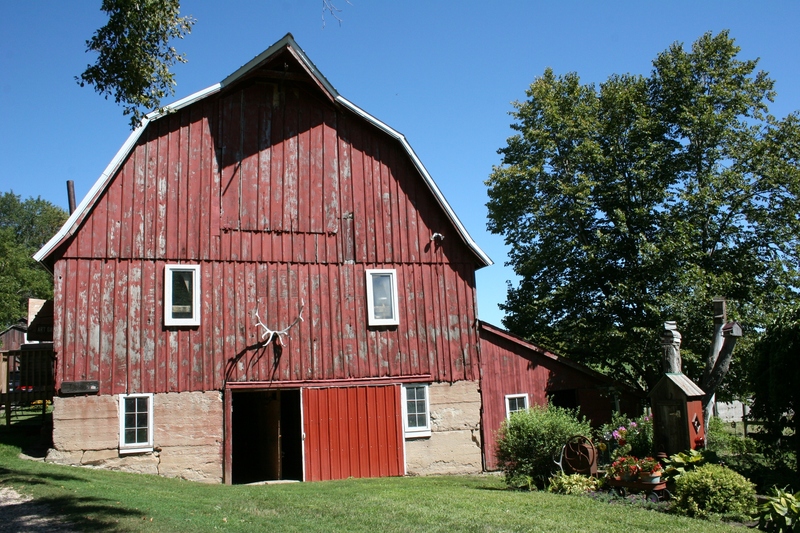 Click here to reach the farm’s website. 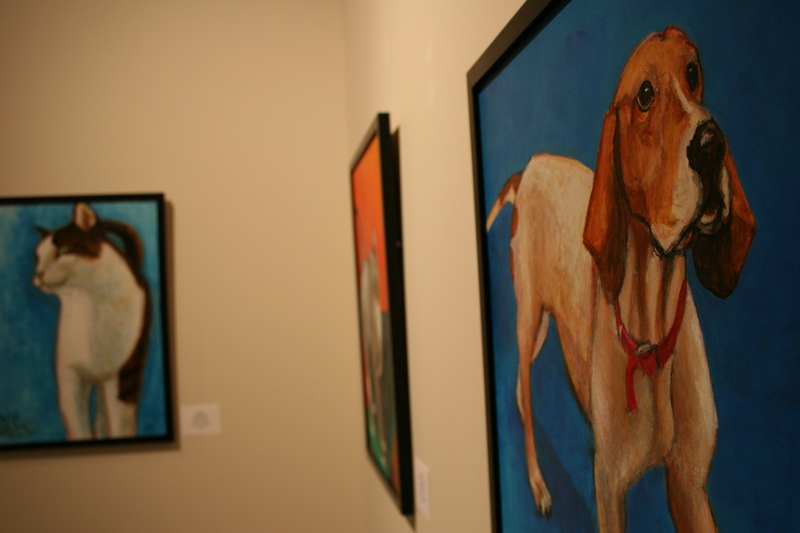 Some of Julie Fakler's pet portraits displayed at the Paradise Center for the Arts in Faribault. COLORS, VIBRANT AND BOLD, first draw you toward Julie Fakler’s art in a current exhibit. But move closer and it is the expressive eyes that connect you to the subjects of her portraits, adoptive animals from Prairie’s Edge Humane Society in Faribault. “I paint domestic animals and I was trying to think of a way to help out local domestic animals,” says this Faribault artist. 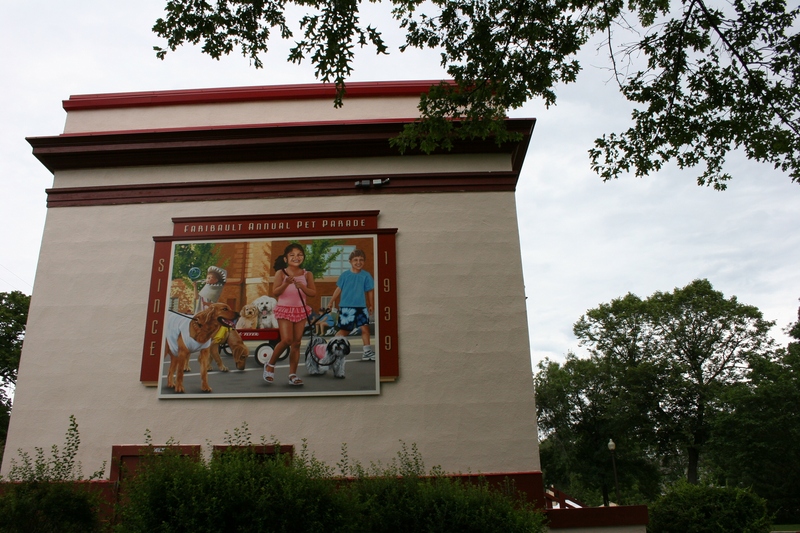 “That’s when I came up with the idea to paint portraits of the animals at the Prairie’s Edge Humane Society.” The local animal shelter will receive a portion of the sales from portraits sold during Julie’s current exhibit. 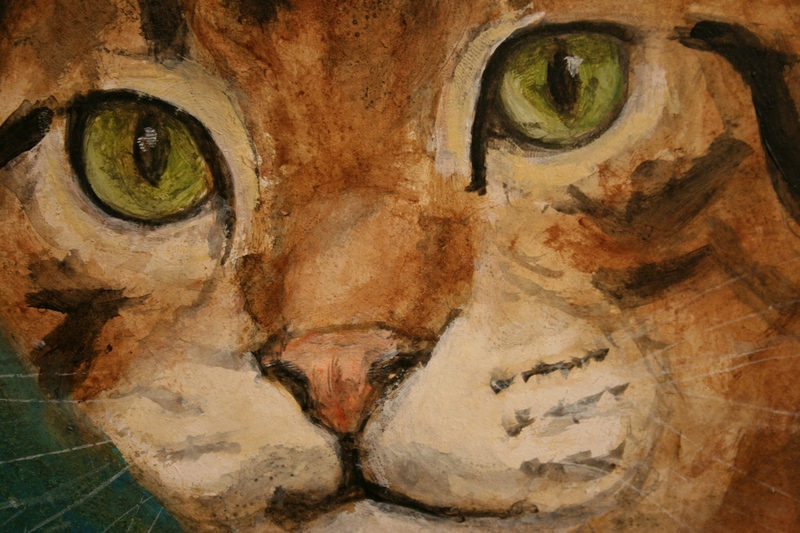 A snippet of a cat portrait by Julie. Julie merges her skills as an artist and her passion for animals into acrylic hardboard portraits that practically pull the viewer in for a closer look. 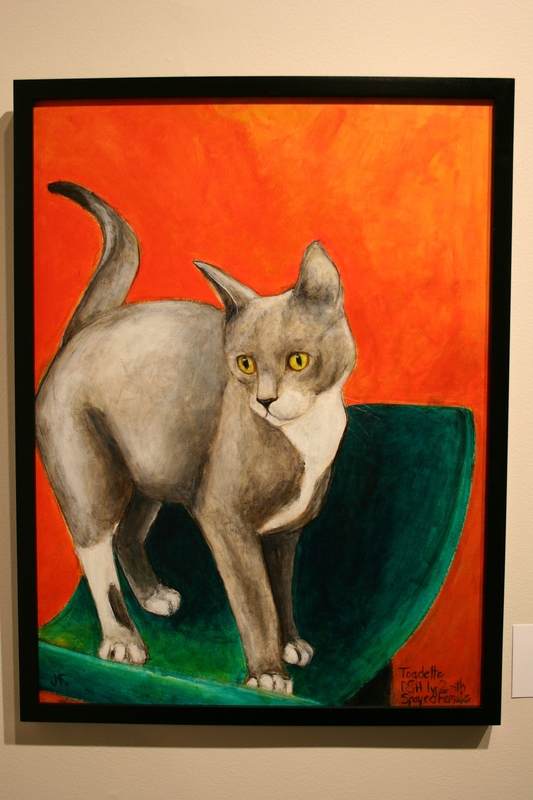 Her work is showing locally in two galleries with “Prairie’s Edge Humane Society Portraits” at the Paradise Center for the Arts, 321 Central Avenue, Faribault, through April 17 and “New Work” at the Northfield Arts Guild, 304 Division Street, Northfield, through March 31. Recently, I perused Julie’s PCA exhibit for the second time, this visit with camera in tow and with the artist’s permission to photograph her work. 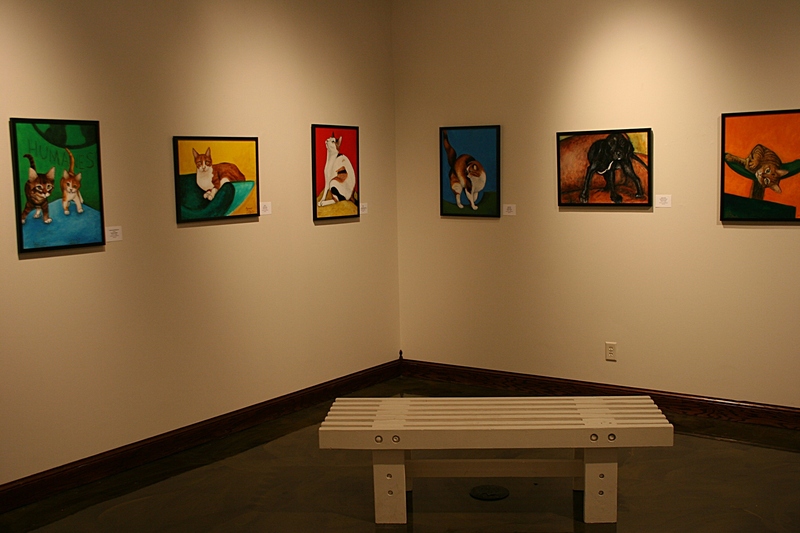 Adoptable cats and dogs are the subject of her Paradise exhibit. A grant from the Southeastern Minnesota Arts Council and McKnight Foundation funded the body of her work and the gallery show. The possibilities seem endless for Julie’s art. The vibrant colors and sweet faces in Julie's art are irresistible. FYI: Click here for more information about artist Julie Fakler. 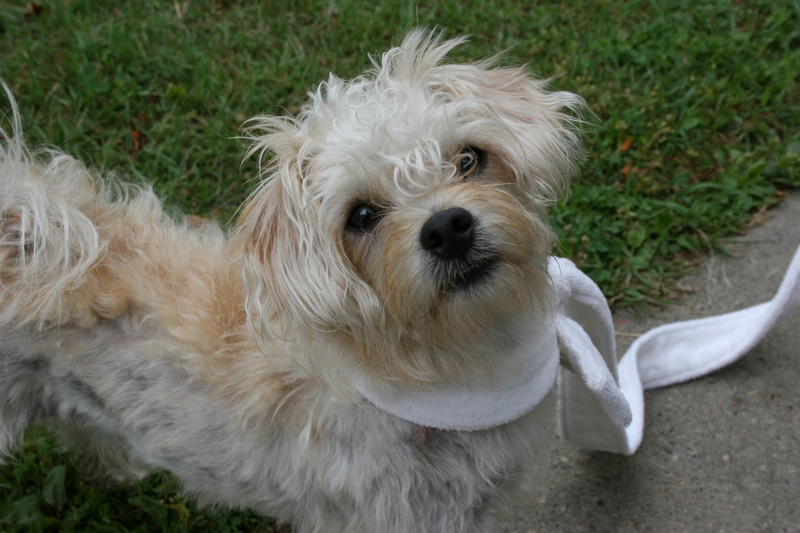 Click here to learn about Prairie’s Edge Humane Society. This isn't my stick horse; mine is long gone. But my parents made stick horses for my two daughters 20-plus years ago. This horse belongs to one of them. 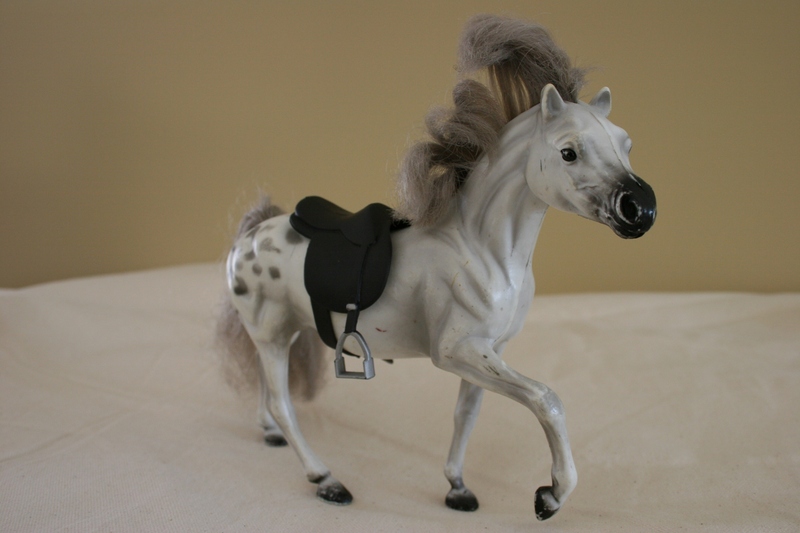 GROWING UP ON A SOUTHWESTERN Minnesota farm, I wanted a horse. Bad. Really, really bad. He stood firm in his belief that horses were dangerous. And then he would give us the facts to back up his fear. Dad would regale us over and over again with the tale of the boy he’d seen lying in the Redwood Falls Hospital with a hoof print embedded in his forehead. Whether that story was entirely true or a bit of exaggeration, I’ll never know. I only knew, unequivocally, that Dad didn’t want any of his six kids kicked in the head by a horse. 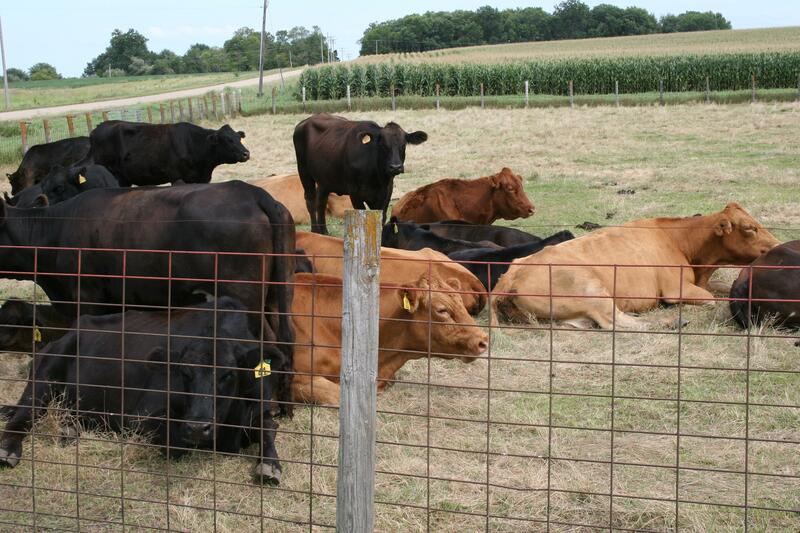 I think he also had concerns about keeping an animal that wasn’t earning its keep on our dairy and crop farm. With tractors, he didn’t need horses that, in his opinion, would do nothing except consume corn and hay that he needed for the cattle. And so my siblings and I improvised. 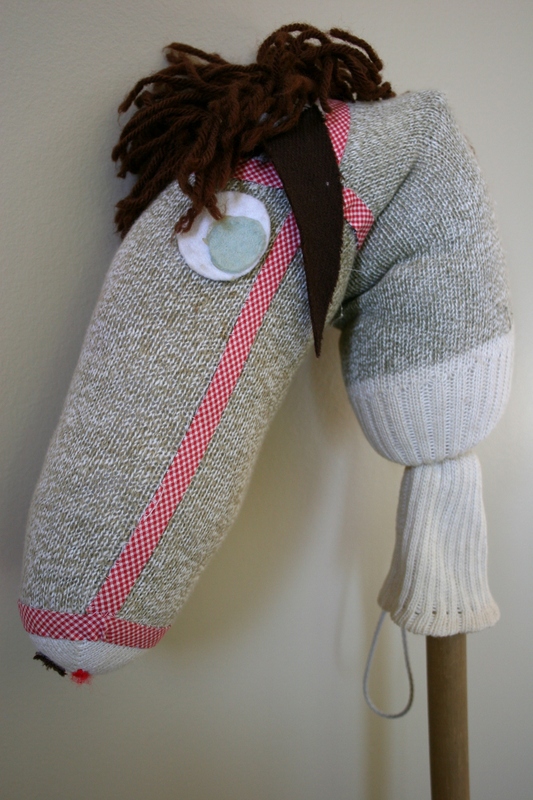 Socks with eyes, mouths and ears and with yarn manes sewn on and then jammed onto sticks became our horses. Stick horses. I rode mine around the farmyard so much that I easily could have ridden to Montana and back. When my siblings and I weren’t riding our stick horses with guns blazing, we were riding our bicycles. Up and down the driveway. On the rock-hard dirt paths we’d carved through the grove. We pedaled furiously, escaping robbers and savages on our bikes turned horses. On occasion, we also straddled empty barrels, slipping our feet into stirrups we’d fashioned from baler twine. We were, if anything, innovative, resourceful and imaginative. Dad wasn’t giving us our horse, so we made do. For my oldest brother, making do also meant attempting to ride a steer. I don’t recall that he was ever bucked off. But I also don’t remember that he succeeded in his mission. My second daughter went through a phase, when she was about four years old, of being obsessed with horses. She drew horse pictures non-stop. I read every horse book to her available through the southeastern Minnesota library system. And I bought her toy horses, all of which are still in a plastic tote for her to someday claim. All of which brings me to this story. Have you heard about the 15-year-old German girl who trained a cow that she can ride like a horse? Her parents, like my dad, told her she couldn’t have a horse. So she improvised. Shortly after Luna was born on the family’s farm two years ago, Regina Mayer started working with the animal. Her persistence paid off as she can now saddle up and ride the cow like a horse. Luna even is trained to jump over hurdles. Apparently my brothers, sisters and I weren’t determined enough. So, instead, we settled for sticks, bikes and barrels. And, on occasion, we cajoled a relative into riding her horse from several miles away to our farm. She would allow us to climb into the saddle for a walk around the farmyard. It was then that I discovered I really didn’t feel all that comfortable riding a horse. But I never told my dad. Not once. 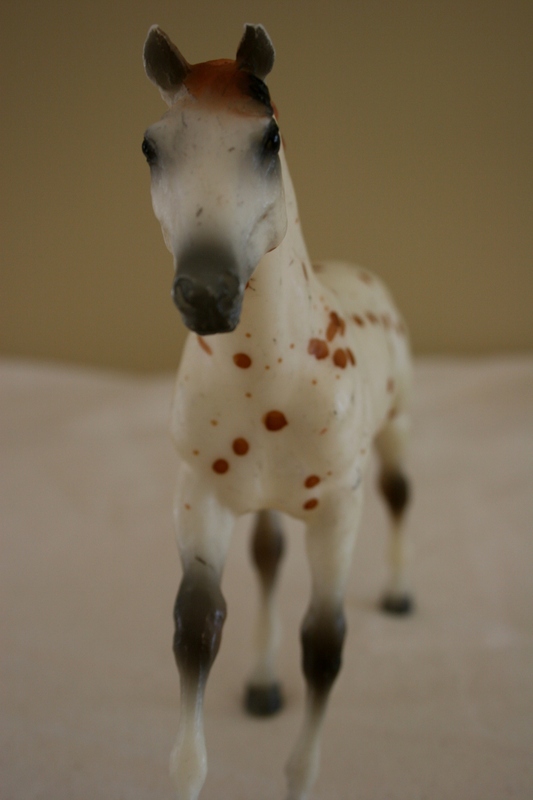 One of the many horses in my second daughter's collection. I SPOKE ON THE PHONE with my mom a few hours ago. As always, I ask her what’s new in Vesta, a community of some 330 in rural southwestern Minnesota. More recently, she’s told me about the corn husks blowing across the prairie from farm fields and onto her yard. Her yard has been raked twice and now it’s littered with corn debris again. She’s going to leave the mess until spring, she updated me today. I have actually seen corn husks piled in drifts against a chain link fence right across the street from Mom’s house. But back to that “What’s new?” question. Today she was prepared with the most unusual of answers. “There’s a moose over by Seaforth,” she informed me. Seaforth is an even smaller town about five miles to the southeast of Vesta in Redwood County. I was stunned. A moose? According to information published in The Redwood Gazette, the area’s newspaper, a couple spotted and photographed the bull moose at the end of their driveway in rural Seaforth. The same moose was apparently seen several days earlier near the river by Springfield, which is even further south and east. The Minnesota Department of Natural Resources figures the moose is seeking a mate or is suffering from a parasite in the brain, either of which could have caused it to wander so far south. In any case, southwestern Minnesota deer hunters have been warned to look before they shoot.